Our next spotlight is Robert (Bob) Smith, a retired theatre teacher and troupe director turned EdTA Emeritus member. Bob also serves on the Virginia Thespians state board as the Treasurer. He has been lending his time and expertise to the Theatre Education Community for years and is a fantastic resource for problem-solving on the stage or in the classroom. Theatre is important because it allows us, as theatre artists and audience members, to examine life in all of its myriad complexities. It allows us to wonder, to rant, to exult, to feel in a supportive environment. This helps us better understand ourselves and the world around us. Do you have any tips for new theatre teachers? Ask for help! Openly seek and be actively open to the experiences of the teachers and other professionals around you. Teaching is often an isolating profession. Theatre teaching even more so. We are expected to be the expert on the spot who knows everything about everything (Of course, the administration still won’t listen to us. ), but we all need help in those beginning years (yes, I can hear my colleagues shouting that this doesn’t change as you get older and more experienced). Don’t be afraid to ask the math teacher, science teacher, history teacher, or other arts teachers for help and guidance. What is your favorite musical (or play)? What makes it so special? I love Noises Off, It’s a silly piece of fluff, but I loved directing it and enjoy watching it every opportunity I get. In all its manic energy, it really lets us laugh at our own foibles and realize that all those bizarre things happening backstage, perhaps, aren’t all that unusual. The first professional production I saw was Jesus Christ, Superstar at the Kennedy Center in Washington DC. Over 40 years later, I’m still trying to figure out how they did the crucifixion scene. I read a quote by Bette Midler talking about her high school theatre experience. She said, “High school theatre is a refuge for damaged children.” Wow! When I read that, I realized, in many ways, she was right and I was one of them. I was the kid who never fit and then I found theatre. I didn’t fit there either, but no one seemed to care. I was actively suicidal in my junior year of high school. Working on a production pulled me out of my depression and essentially saved my life. I wanted to be there for those students, like myself, who need something to care about and someone as caring as my theatre teacher. I don’t know where I would be, or whether I would be, without it. What playwright would you love to have lunch with? Tell us a question you’d ask them. Ok, it may be trite, but I would really love to have lunch with Will Shakespeare. I would ask him how he really felt about women. He worked in an all-male environment, but wrote so many great women. I’ve had a lot of arguments over the years about his treatment of Kate and I would really like to know what he was thinking when he wrote her. Tell us about the moment that made you decide to get involved in theatre. Theatre snuck up on me. In my freshman year, I had a great English teacher in high school, who also taught Latin, and Theatre. I took Latin as a sophomore because I liked him. One day, he came to class and said he had this theatre thing going on and needed some folks to work backstage. My entire line of thought was “like him – want to help – what can it hurt?” Three days later, I got my hands on the light board. I never looked back. I rotated my leads. If a student had a lead in a production, she automatically wouldn’t get one in the next production. She could get a supporting role, bit part, or work backstage, but not a lead. 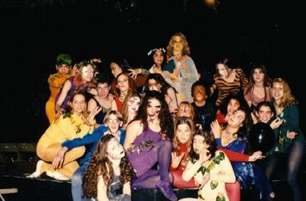 (Example my Romeo played Mustardseed in back to back productions of Romeo and Juliet and A Midsummer Night’s Dream). I did this because I wanted more students to have the opportunity to play a lead. Serendipitously, I realized that my program had a great depth of field because of this policy. When seniors graduated, there was always an experienced group of performers ready to step up. Every Monday afternoon, during production season, we held a production meeting. All designers, crew heads, and management were required to attend. Actors were welcome as well. In these meetings, we discussed where the production was, what problems we had encountered, and how to solve them. We worked as a group of collaborative artists. I made the final decisions, but most of the time the decisions made themselves through group consensus. The students never had any doubt that they were being heard and that their artistic and operational ideas were valued. They knew they were fully involved in the creative process. What would you consider your biggest failure and what did you learn from it? I directed a show that ended with a hanging. We really worked hard to make the hanging look realistic and still be safe. It took us about a month to get the rigging perfect and to work with the actors to enhance the overall effect. When we reached tech week, the hanging was spectacular; however, the show was mediocre. In working so hard on the hanging, I had somehow failed to effectively direct the show. This experience taught me about the dangers of tunnel vision on artistic work. I learned that I need to be more concerned about the overall effect of the production rather than getting lost in one piece of it. Everyone has at least one good theatre story. Tell us yours! When I was in high school, on a performance night – during a really dramatic scene, the work lights suddenly came on and a custodian ambled across the stage, picked up a trash can, ambled back across, and turned off the lights. I actually use this experience during my productions. I created my “Disaster Rehearsal” in which anything and everything can and will go wrong. I do it for every production right before tech week. It’s a training tool to help actors and technicians learn how to handle problems on the fly and still make the production work. They have to deal with the “disasters” and still get the show believably to its correct ending. That’s a hard one. I would love to live in London and immerse myself in all of the theatre and history there, or Florence, Italy with all its art and history, but I would probably most like to live in Hawaii. It’s beautiful and warm there. I can create my own theatre and history. 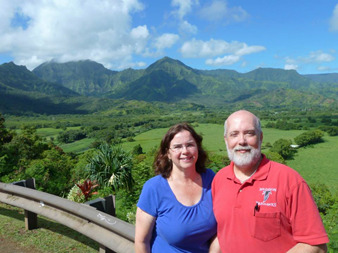 Bob and his wife in Hawaii. If you enjoyed Robert’s interview as much as we did, add him as a contact in the Community.